Nora Grant is a young coffee farmer living in Kenya in the 1970s. She has disbelievingly stumbled upon her husband, Julius, engaged in what appears to be ivory smuggling, one of the European's dirtiest games. Before Nora can confront Julius, he is killed in accidental circumstances that soon look more like murder. 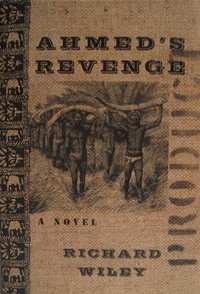 Nora investigates her husband's affairs, coming across a succession of people whose lives intertwine and intersect: her own father, living out his retirement in England in an apparent innocence; Mr. Smith, who might be a murderer; Mr. N'Chele, who might be a smuggler; Miro, the opera singer; Detective Mubia, a policeman of divided loyalties--and Ahmed, a massive African elephant, whose remains are preserved at the National Museum in Nairobi and in whose name revenge must be sought.